Jarlath Regan is an Irish comedian and podcaster based in London. A former graphic design consultant, Jarlath Regan began his stand-up comedy career in 2003 and by the end of 2004 was a finalist for three major UK comedy newcomer awards: So You Think You're Funny, BBC New Comedy Awards and the Chortle Student Comedian of the Year. Award winning comedian, writer and broadcaster, Jarlath Regan has gained a reputation with the industry and audiences for his uplifting, inventive and relentlessly funny stand-up. His performances have made him a firm favourite in all the top clubs on the UK comedy circuit and his award winning An Irishman Abroad podcast, where he interviews some of Ireland’s most famous exports, has won him universal acclaim and a global audience. Since 2007 Jarlath has brought seven solo shows to the Edinburgh Fringe. Between enjoying sell-out runs and earning rave reviews, it’s easy to see why he has become a darling of the festival circuit. 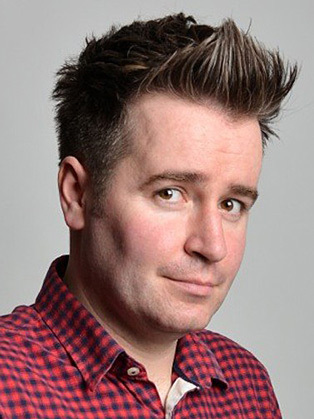 Jarlath’s numerous international comedy festival performances include appearances at The Montreal Just for Laughs Festival, The New Zealand Comedy Festival and the Melbourne, Adelaide and Brisbane festivals as a part of the Best of The Edinburgh Fest Showcase tours. In 2013 Jarlath created his An Irishman Abroad podcast. Show features in-depth interviews with Irish stars such as Graham Linehan, Dara O’Briain, Chris O’Dowd and musician Lisa Hannigan about their experiences abroad. In just a few episodes it shot straight to number one in the iTunes charts, won glowing reviews from the press including The Guardian. The Daily Telegraph went as far as to say that it “could turn out to be one of the biggest podcasts since Ricky Gervais picked up a microphone.” The Irishman Abroad podcast was named to the much coveted iTunes Best of 2013 list as the best new audio podcast of the year. A finalist in both the BBC and Channel 4 New Comedy Awards, Jarlath’s first published book How To Break Bad News (Transworld for Random House) was an instant best-seller. Comprising a collection of his beautifully illustrated while hilariously dark greeting cards, the book gained many celebrity fans including Ardal O’Hanlon who called it “Original, funny and deliciously wrong!” Jarlath’s second book Putting A Ring On It – What Not To Do When Attempting To Get Married, was released in April 2011, featured more than 200 brand new illustrations and became a cult hit. Jarlath’s other credits include Russell Howard’s Good News (BBC3), Comedy Central’s The World Stands Up, Last Comic Standing on NBC, Live at The Stand Comedy Club (BBC Radio Scotland), The Blame Game (BBC Radio Ulster) and The Apprentice You’re Fired (TV3).